Success Starts At The Core. These are the core values we live by when finding and nurturing new talent. It is through these ideals we have developed a united workforce delivering unparalleled service to the communities we serve. We post them here as a daily reminder that these fundamental values guide our daily practice. Whether management team members come from within the COA family or brought in through recruiting methods each candidate must complete a four-week school leadership-training program (SLT) with a Certified Trainer. SLT offers a wide selection of content in management development, early education, leadership skills, time/project management, and job-specific coursework. We encourage participation and partnerships with State Quality Initiative programs to provide additional training and technical support. 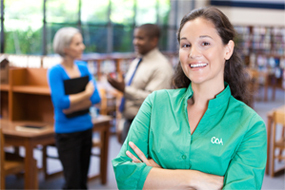 COA has created a series of on-site, work-based training opportunities for our teaching staff to hone their professional skills. Initiatives include Individualized Training and Small & Large Group Workshops. Teachers explore techniques of the classroom designed to help our educators perform effectively. Additional programs include our group-study classes in childcare fundamentals with classroom management instruction, CPR/First Aid and professional development conferences. Training programs for new employees include a New Employee Orientation program aimed at helping employees succeed. Assigned mentors conduct classroom observations of the new staff members to aid in professional development, shadowing the new teacher, then additional support is provided through ongoing classroom observations and mentor meetings.